When the publisher sent me the book and I first read the description, I braced myself for a super-charismatic-fire-from-heaven how-to book all about how to make God do crazy miraculous things in your life just by knowing the right spiritual buttons to push. But I was pleasantly surprised, and somewhat relieved, to find that this is not what Wilkinson is encouraging in You Were Born For This . In fact, the kinds of miracles Wilkinson talks about are rarely those signs-and-wonders spectacles that charismatics and conservatives get all worked up about one way or the other, though there are a few examples of healings. Rather the book focuses on those amazing God-incidences (coincidences that God orchestrates). Like when you’re in your hour of desperation because you can’t pay the bills this month, and a stranger shows up out of nowhere and hands you the exact amount you needed. You’re left praising God and wondering about the mystery of it all. I have certainly had a few of those experiences. 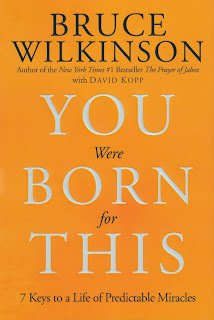 What Wilkinson says in the book is that any one of us can be that stranger. We can deliver a miracle to someone’s life if we’re just willing to be used by God and learn to listen to the Holy Spirit’s guidance. You could be the one to hand a stranger money, you could be the one to offer encouragement when hope seems lost, you could be the one that introduces them to the love of Jesus Christ, etc. Honestly, I was looking for things to dislike about this book. I don’t like step-by-step guides to God and obeying God. It’s all too self-helpish. But this book doesn’t have one thing in it about seeking miracles to help yourself. If you were to follow the directions exactly as he writes them, the worst you could do is be used by God to help someone in need. I gave it a go while reading the book, and God did some amazing things.